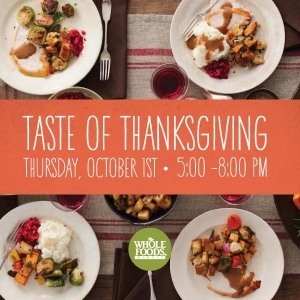 The Annual Whole Foods Market Taste of Thanksgiving event is back and will be happening on Thursday October 1 from 5:00pm – 8:00pm at the Robson location (1675 Robson St). Celebrate the arrival of autumn at this community event that champions local, organic and homecooked food. Purchase a $10 passport when you arrive in order to taste your way through multiple seasonal food stations. Why not sit and enjoy your meal in the store’s cafe space with your neighbours? Take out options are also available. All proceeds of the event will benefit Lord Robert Elementary School in the West End. The team at Whole Foods Robson would love for you to join in the festivities and bring along your friends and family. You can RSVP for the event on the Whole Foods Market Robson Facebook page.